Can Nvidia's former golden boy shine once more? Not so long ago, Nvidia's GeForce 8800GT was our favourite graphics card of the lot. In the same league as the Nvidia GeForce 3Ti and ATI's 1900XT, it had the sort of performance per pound ratio that flew off our charts and shamed all its contemporaries. Then it was renamed the '9800GT', and we still liked it though – just not as much as before. Hoping to win back some of our initial love for the G92 core, Gigabyte has taken the relatively old chip and invigorated it by fitting an enormous passive heatsink. Given that game engines really haven't advanced much since the original was pumping out frame rates with the best of them, it follows that decent performance plus absolute silence should be something of a winner. Not just for a lounge-based media centre, but any gaming rig that you don't necessarily want to sound like a jet engine taking off. 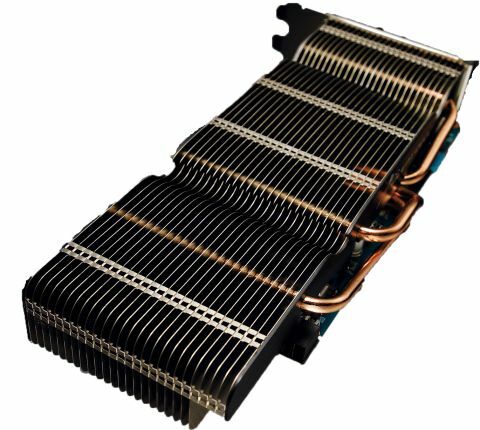 It certainly looks the part, with large copper pipes sprouting out of huge aluminium slats designed to convect the considerable warmth produced by the processor to a point on the card that it can be effectively disposed of. And it works very well too – we only had one problem benchmarking it that could possibly have been down to overheating, and were unable to reproduce it again. More to the point, although it's clearly not as powerful as AMD's incredibly good value HD4770, it scales with resolution and image quality far better, so much so that with all details cranked up the two cards are equal. At lower settings the AMD card slaughters it, but again the 9800GT remains playable. So if it's silence you crave and you don't mind paying a premium, it's not a terrible choice.